It could maybe be like this? I'm only really speaking up about one theme. Frosted Pine. Where did the Pine go? I live surrounded by pine trees, trust me, even in snow it's brown, green, grey that dominate not the white. I can understand maybe wanting a little more variation to the theme, but please don't let white become the base. I adore the grey body color with layers of different greens, a little brown, and a touch of white built on top. That's what attracted me to the theme in the first place. This was by far my favorite design, (i'm partial to the fall designs) but the proposed version loses all the feeling of mischief and mystery the original design had. The blues and teals become overwhelming in the new design, looking more like a summer ocean theme than a spooky midnight theme. As requested, I have here the reminder of pretag lups needing an update. Edited By Squigles on 1/20/2019 at 9:13 PM. First, I just want to say that, for the most part, I like a lot of these revamps and color changes. Overall, I think they improve the look of the themes and offer some needed color variations. That said, I'm not thrilled with the added blue on the Seashell theme. It's pretty, but the colors were based entirely on undyed seashells, which primarily come in whites, creams, and browns. If an extra color splash is needed, I'd prefer more of a coral or an orange-purple color, as can be seen in images like this one I used for reference https://www.google.com/url?sa=i&rct=j&q=&esrc=s&source=images&cd=&cad=rja&uact=8&ved=2ahUKEwi5tZPo3f_fAhXyOn0KHXZ2AAIQjRx6BAgBEAU&url=https%3A%2F%2Fsciencing.com%2Fidentify-seashells-atlantic-coast-8430597.html&psig=AOvVaw2sxbmGBcy3VcCuvkUq1W7Y&ust=1548189309060126. Other than that though, I'm definitely looking forward to the color update! Now, I love the new golden foil, dont get me wrong, but the one thing Id change is the A1 accent color. See, its right now a bright yellow, so if we use Spotted Fox or lets say Tribal Markings the yellow isnt that visible. And to be honest, its not that pleasing to look at. Now, if you change it to a reddish brown, so that it doesnt clash with the gene colors, and its easy to spot the accents look much much better! And I know its a small thing, but I think it helps a lot! or you could make it a really dark brown so it still sticks out. I prefer the darker brown but either brown seems to work. it also helps with gene 3 where the tail markings would be really hard to see. its so much easier to see. however, with the reddish brown- its harder to see g3 and just seems to absorb the color- which is why I suggest the darker brown. Or you can change c1 and A1 but I mean, its more change for less. This is my favorite one of the bunch since it makes it look a lot more like the original theme. Edited By Caw on 1/28/2019 at 11:47 AM. there are some really nice ones in there, and some we don't like as much, and I might go through and list them later, but for this particular moment, I just want to say I feel like the proposed Tree Moss is just, too much pale white-green? Edited By Scathreoite on 1/22/2019 at 11:25 PM. Inverse the colors and it looks great! But then you're stuck with dark AC2 for almost every other M1, M2, and M3 trait. 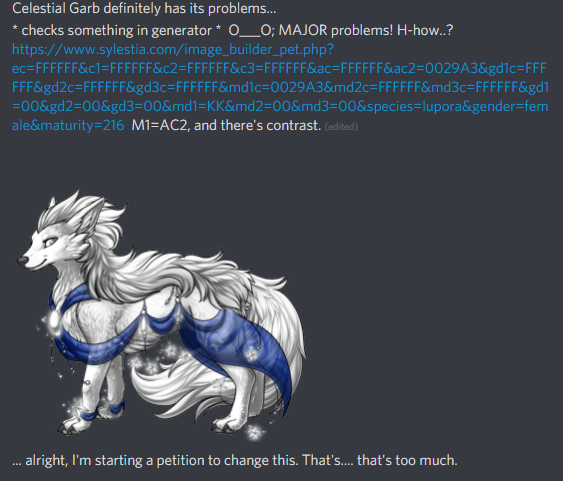 Why should I have to sacrifice what I want for almost every other mutation just to make ONE technically flawed but otherwise beautiful trait work..? So my initial thought of "AC2 being darker than M1 to make it work" was correct... ish. I like to be thorough so I tried again with a black base... Now the opposite applies! So NOW, with a black base, AC2 being darker than M1 = bad. Now let's apply this to a theoretical theme idea, one that's intended to work well with any trait combination. "Theoretical Sunrise Lupora"
Good and good. No issues caused by the trait. Everything is fine. Great mutation. Technically sound. Good enough and... no. Add husky and the swirls are harder to see. They were already fairly hard to see, but now it's just an epic failure. Maybe reverse the AC2 with the mutation colors..? Hah! Oh that's funny. No, no, definitely no. It got worse. And just to point this out, the colors used are yellow and peach. Two different colors should NOT have this much trouble contrasting each other. On everything else - EVERY other mutation with any trait combination - it works without any trouble. Except for Celestial Garb and its weird insistence on "if you want to go subtle my colors shall be a blob, so forget all those pretty mutations you just previewed and start over to suit ME! >:P "
Umm.. some of the themed pets we're already re-gened will they be able to get re colored?